Ask fellow campers about "Connor Battlefield State Historic Site" and nearby attractions. This small state park tucked into an oxbow curve of the Tongue River makes an excellent overnight stop. It is well maintained, with several pull through sites. A small light near the payment drop box would have been helpful since we arrived after dark. The sites were gravel, and mostly level. Would be happy to stay here again. We camped at Connor Battlefield State Historic Site in a Travel Trailer. A very quiet park with some long pull throughs and a few sites right on the small creek that flows through the park. The road is somewhat narrow through the park for a big rig, but doable by going slow and swinging wide on the turns. Verizon was just OK and satellite dish worked fine from our pull through site on the north side of the park right along side the creek. One site overlooks a small dam (20 feet from the site) where we saw some fly fishermen catching and releasing good size trout. One other RV and one tent the night we stayed. We would stay again. 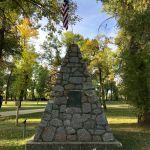 We camped at Connor Battlefield State Historic Site in a Motorhome. What a nice area to camp. This place is just inside Ranchester with only a small, brown sign to show the turn. Once you get to it, though, it's fantastic. The campground was deserted, we were the only ones there so the quiet was great. The river goes around three sides of the campground so it seems like your on an island. Campground was clean, though primitive, but we like that sort of camping. At only $9 a night, it was the best deal around for our 1 night. Would highly recommend to anyone looking to stay from one to three nights. Great place We camped at Connor Battlefield State Historic Site in a Tent. 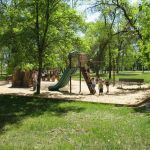 This state historic site is a beautiful park-like setting next to the Tongue River and was the site of the Battle of Tongue River in 1865. The majority of the park is surrounded by old, large cottonwood trees; however there are several sites that are in the open. The park does not take reservations, so with the first come/first served you can pick the site that suits you best. Most of the sites are back-in and three sites are pull-thrus. We picked a pull thru that would easily accommodate two forty-footers plus toads. We had no problem using our TV/internet satellite dish here. This campground is dry camping only and we encountered tenter's, small vans, and motorhomes. This is a great location just a few minutes off the interstate for a one-night stay or a several-night stay in order to explore the mountains to the west. 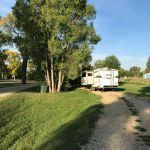 We camped at Connor Battlefield State Historic Site in a Motorhome. Are you affiliated with Connor Battlefield State Historic Site ?